﻿ [Peterhof?] Palace room with gold wallpaper, checkered wood flooring, and gold chairs with white and red upholstery. [Peterhof?] Palace room with gold wallpaper, checkered wood flooring, and gold chairs with white and red upholstery. Peterhof? 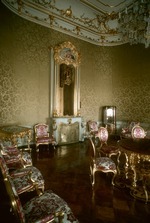 Palace room with gold wallpaper, checkered wood flooring, and gold chairs with white and red upholstery.